The culture of the food blogger is an unusual one – most of the time we sit behind illuminated screens, tapping furiously at keys, we converse via. Twitter, email and blog comments, we claim that some of our “best friends” not only live in another part of the world but that we haven’t even met some of them in person, we hide behind camera lenses, snapping everything we possibly can, or shoot video segments in the most awkward places. By all intents and purposes, we should be strange antisocial creatures, unable to hold normal conversations, insular and shy. We should be very odd. But we’re not. Well, some of us may be a little odd but – to take the words of Lady Gaga (oh dear) – baby, we were born this way. It’s not much of a surprise, then, that when the lovely Vanessa Kimbell suggested a food blogger Christmas gift swop at Fortnum & Mason, she had an overwhelming response from food bloggers near and far. The rules were simple: bring a gift that fit into one of four categories (pickles and preserves, sweets, drinks, and baked goods), share your recipe on your blog and take home somebody else’s. Simple, right? 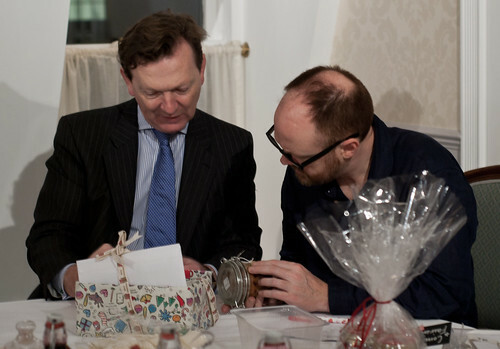 Then the incomparable Dan Lepard offered to judge the categories, with prizes donated by Fortnum & Mason, Aga, Rococo Chocolates, Leith’s Cooking School, Dan Lepard and Kenwood and suddenly it was game. On. I had decided to make a trio of seasonal jar pies for my entry and had tested them for 3 days, forcing everyone around me to try them and give me their opinion, but watching my entry get shortlisted and Dan and John from Fortnum & Mason taste-testing them was by far one of the most nerve-wracking things I’ve ever experienced. “Terrified” doesn’t even begin to describe how I felt as I stood frozen to the spot, watching as they inspected the jars for – what seemed to me – an age. It was all much more serious than I think any of us expected, adding a somewhat unexpected element of stress to an otherwise beautiful afternoon of tea, cakes and excellent conversation with old and new friends. Vanessa & Dan address the room. What you have to understand is that, though we’re sometimes pitted against each other, really what we as food bloggers are is part of a community who support, nurture and care for each other. Relationships move quickly in this world – you trust strangers in ways that no sane person would (remember how at the beginning of this year I travelled the world meeting, staying with and sharing meals with various food bloggers for three months?!) but it’s inexplicable, you just know that you’re not going to end up hacked into little pieces and baked into a mystery pie. One friend, whom I have only known for a year, met once when I visited her home town for 2 days but whom I Skype call whenever I can, giggle over ridiculous things and share anxieties and joys, would definitely be one of my bridesmaids were I to ever marry; we joke that if no wedding comes my way we’ll just run off together. I have kindred souls all over the globe and I’ve only connected with them through this wonderful journey. I think it’s also important to note that this was not the first (and nor will it be the last) blogger get together in the UK – there were individuals at the event (and some who couldn’t make it but need to be acknowledged) who have been real lynchpins of the community, who have gone above and beyond to organise pub lunches, karaoke sessions, teas, dinners, supper clubs and food swops; these people should not in any way be sidelined or forgotten just because their efforts haven’t been as “high profile” – they’ve been working to bring this community together for months and, in some cases, years. I can only send my greatest thanks to them and promise that the next time I see them they’re getting a huge hug (and maybe a cookie or two)! Though I didn’t win my category, when all was said and done, seeing your friends collecting prizes, looking shocked and happy to have won, was truly lovely. Yes, there was an element of disappointment, but more than that was the feeling of pride: pride to be one of these amazing creative people, pride for your friends’ winning creations. At the end of the day that’s what it’s really all about. Congratulations to the following winners – sending you all a huge hug! Drinks – Damson Schnapps by Jayne. Baked Goods – Amaretti Biscuits by Claire. Sweets – Cranberry & Port Mincemeat Pops by Snezhana. Pickles & Preserves – Blackberry Curd by Urvashi. I’d quite like Nazima to be my mom! Especially if she made me more of these! All in all, it was a great way to spend an afternoon. 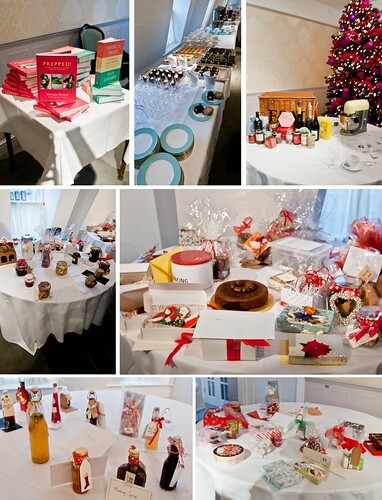 A huge thanks to Vanessa for organising the event, to Dan for judging it, to Fortnum & Mason for hosting, to all of the companies who donated prizes and a special big thank you to everybody who attended – see you at the next get together! But enough rambling, you want my recipes don’t you? Of course you do. I’m a real champion for jar pies – they’re amazing gifts to give as you not only get a delicious (single serving) treat, you also get a mason/preserving jar to use! You can either pie it forward (a term Momma Lee & I came up with last year to describe your baking a new pie in the jar and gifting it to somebody else), or you can use the jar for preserves, chutneys, drinks, homemade vanilla essence, storing sugar, pasta, flour, etc. Go wild! 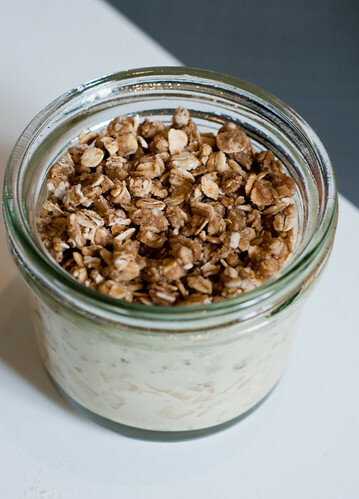 You can also gift jar pies raw or baked – raw will keep in the fridge for up to a week or frozen for about 6 months (but obviously this depends on how cold your freezer is, I’d treat it the same as ice-cream, though). Baked will keep at room temperature for up to 3 days or in the fridge for a week. You can eat them hot or cold but if you want to reheat them place the jars in a cold oven, then bake at 180 degrees C for 15-20 mins (keep an eye on it, it may need longer depending on how quickly your oven heats up). If baking raw from refrigerated, add about 15-20 mins on to the baking time and if from frozen, add about 20-30 mins on to the baking time. You’ll know when they’re ready as, surprise surprise, you’re baking them in a glass jar! You can see exactly what’s going on! 1. Always remove all lids, metal, paper, etc. before placing in the oven. Exploding glass + food = not good. 2. Never expose your jars to extreme changes in temperature and, just to be on the safe side, always start your pies in a cold oven. I’ve never had a jar shatter or crack on me (and I’ve made a few of these) but I’m overly cautious. Be sensible and you’ll be fine! Equally, do not substitute jam jars – the glass isn’t thick enough to withstand high temperatures and they will crack/explode! 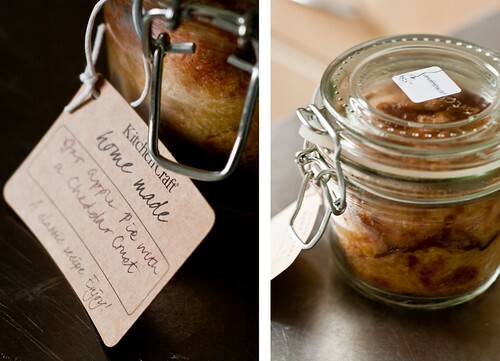 I like the Kitchen Craft Home Made glass terrine jars, available online and in some specialty kitchen stores. 3. The measurements given are for 4 of each pie (because nobody, except me, makes single pies at a time!). As such, you may find that if making only one pie at a time you have a little extra leftover (particularly the Self-Saucing Pear Crumble topping and the Nantucket Cranberry Pie top). If you’re planning on eating these straight from the jar and not putting lids on them, you can fill them right up to the top, in which case you probably will use all of the topping in the given measurements. 4. 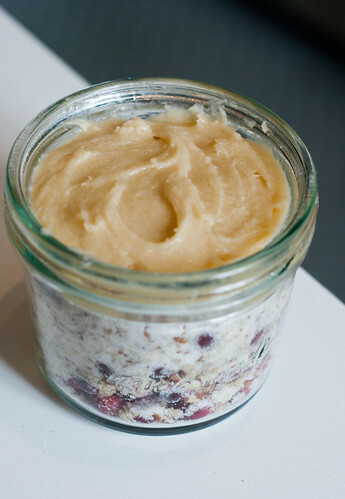 The Nantucket Cranberry Pie does contain nuts – a nice substitute would be crushed oat biscuits, eg. Hobnobs. 1. Sift together the flour, sugar and salt into a large bowl. 2. Rub in the chilled unsalted butter with your fingers until the mixture resembles coarse grains. 3. Add the vegetable oil and ice water and press together with a spatula until it begins to come together. 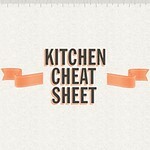 Add the grated cheese and use your hands to incorporate it into the dough until well distributed. Wrap the dough in clingfilm and refrigerate for an hour. 4. Whilst the dough is chilling in the fridge (word), peel, core and slice the apples thinly. You may want to halve the apple slices to help fit them into the jars more neatly. 5. Combine the apple slices, brown sugar, cinnamon and cornflour and set aside. 6. When ready to assemble, remove the pastry from the fridge and divide into 4, then separate a small piece from each of the 4 (for the pie tops) and set aside. Working a jar at a time, take small pieces from the larger portion of the dough and press it into the jar, leaving about 2-3 inches at the top. 7. Layer the apple pieces in the pastry in concentric circles. 8. Lightly flour a work surface, take the reserved pastry and roll out to about a 1cm thickness. 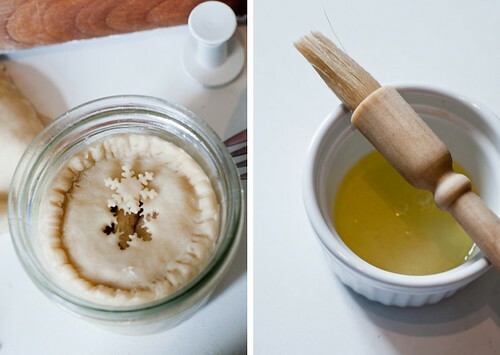 Cut a steam hole out of the top and place the pie lid on top of the jar pies, pressing around the edges to seal. Use the tines of a fork to flute the edges of the pastry. Brush lightly with the egg white and sprinkle a little of the caster sugar on top. Repeat for the following 3 jars. 9. Place in a cold oven and turn the heat up to 180°C. Bake for 40-45 mins until browned. Serve with vanilla ice cream or double cream and enjoy. 1. Peel and core the pears, then chop into small pieces and toss with the brown sugar. 2. In a separate bowl, whisk together the egg yolk and cream then pour on top of the pear mixture and mix well. Divide the mixture between the four jars, leaving about 2-3 inches at the top of each jar. 3. In a large bowl, combine the rolled oats, flour, brown sugar and cinnamon. Add the butter and rub in to the mixture, making sure the crumble remains chunky. 4. Top the pear with the crumble and press down a little so that there’s a 1-2 inch gap at the top. 5. Place in a cold oven and turn the heat up to 180°C. Bake for 35-40 mins until the fruit is soft and the crumble is golden brown and crispy. 6. Eat hot and enjoy! 1. In a small bowl, combine the cranberries, chopped pecans and caster sugar. Divide evenly amongst the jars and set aside, making sure you leave about 2-3 inches at the top. 2. In another bowl, sift together the flour, 115 g of caster sugar and salt, then add the butter, eggs and vanilla extract and stir gently with a spatula until just combined. Do not overmix. It should have a thick ribbon consistency. 3. Divide the batter carefully amongst the four jars, using a spatula to spread the mixture if necessary. 4. Place in a cold oven and turn the heat up to 180°C. Bake for 45 mins, remove from the oven and divide the remaining tablespoon of caster sugar amongst the jars. Place back in the oven for 5-10 mins. 5. Don’t worry if the batter has risen or a steam hole has appeared during baking, simply use the back of a spoon to push the top back down gently on top of the cranberries (they’ll have reduced during baking) and smooth out. Serve hot with ice cream or double cream – enjoy! A lovely lovely idea of swapping home made gifts, really made the gathering specific to food bloggers, a fabulous idea from Vanessa. I agree that the competitive element did seem to drive some people but as you say, it was really moving seeing the winners faces as they were announced. I love your pot pies, I think they looked fantastic. Would have loved to have picked those from the raffle!!! 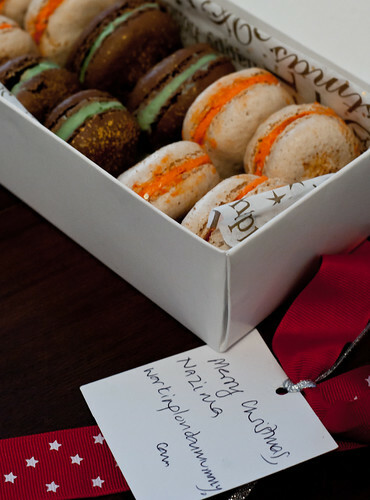 What an awesome idea, swapping fantastic foodie presents. Makes the event much more personal. Really cool! 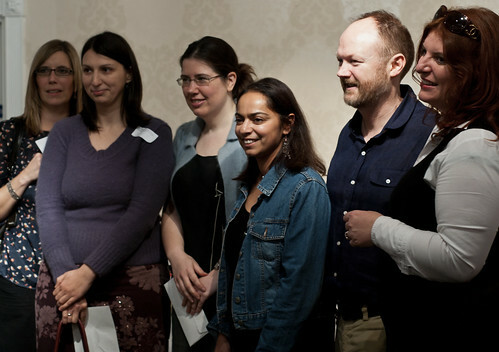 Great post – and hear hear to saying that this is by no means the first UK blogger get-together. Loads of people have worked hard over many years to build the community to the point where it is today & the onus remains on all of us bloggers to maintain it as a supportive and (reasonably!) cohesive community. I feel like a relic when I say this in today’s rampantly competitive world, but the community aspect of blogging is one of the most unexpected and very best things about it as a hobby. Super post, I was so pleased to see you the other day. I did raise an eyebrow at Dan’s comment about it being a pivotal event to get bloggers together like that but maybe he just didn’t realise how much we all hang out together!! I think you’ve nailed the sense of community right on the head. That’s the biggest thing I’ve gained from food-blogging and like you, have formed some otherwise entirely unexpected friendships! Lovely post, almost makes up for me not being there…..I was thinking about you all at the time and glad it went so well, but of course I knew it would! This was such a fun afternoon, but I’m kicking myself now for not taking more note of what was on the tables. I didn’t see 1/4 of the gifts I’m now seeing on blog posts. Your puddings for one, such an interesting idea. Nor did I see those delectable macarons. I too was a little surprised by Dan’s comment – we’ve even managed a couple of small gatherings in the South West – albeit rather small ones! Oh Jackie, love love love these pies! I am so very proud to be a part of this community and I wish I could have been there! 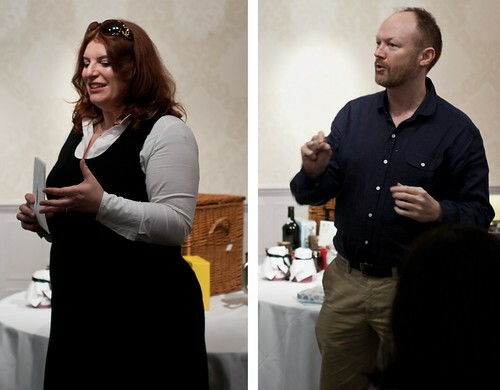 I’ve only be blogging for a couple of months so it was my first event and I thought it was fantastic. I met some lovely people and hope I’ll get to meet others, including yourself, in the future. 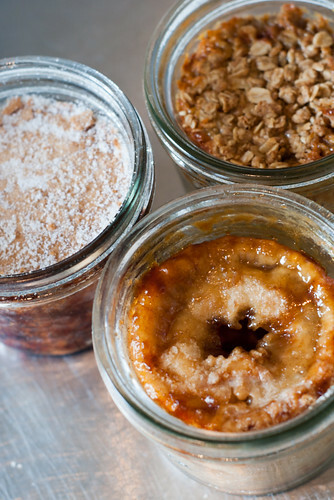 Your pies looking delicious – especially the crumble. Thank you for that hug! What a lovely post, it was such a great day. 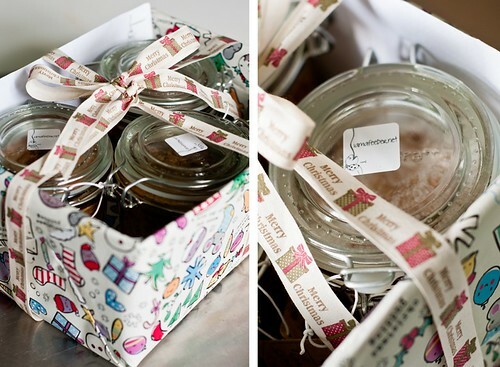 I really love your jar pies – fab idea! Another excellent post. 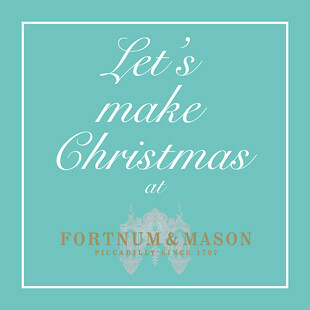 I think that an annual Christmas tradition has just started with Fortnum & Mason and UK food bloggers. 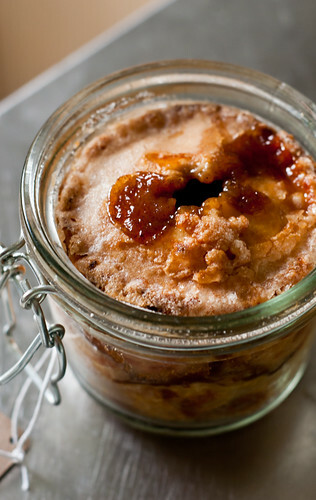 Your jar pies are definite winners with me. Wow what a beautiful website, so well thought out and easy to use and fantastic posts, shame we didnt get a chance to chat at the Fortnum event.